Mando Mafia have been delighting audiences with their award winning "wall-of-mandolin" sound, playing concerts, music and art festivals, dances and dance weekends, wine festivals, weddings, parties and other special events in the Mid-Atlantic states since 1989. Their recordings have been heard nationwide on National Public Radio's All Things Considered and played on radio shows all over the US and as far away as France and Australia. Though the band's music has its roots in Appalachian Old-Time String Band traditions, it has branches just about everywhere. A typical performance might, in addition to old-time hoedown music, include calypso, reggae, rockabilly, klezmer and bluegrass, together with the occasional Finnish wedding march, Chilean sikureada, Puerto Rican or Argentine waltz, and Italian polka. As one reviewer in Bluegrass Unlimited put it: "They have no problem grabbing material from any source that suits their fancy and placing their multi-talented stamp on it." The result is a sound that is, to quote another reviewer from England's Folk Roots magazine, "danceable, foot-tappable, unignorable and irresistible." 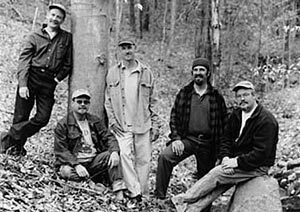 No strangers to competing, individual band members have won instrumental contests in Maryland, Virginia and North Carolina; collectively the band has won the non-traditional band competition at West Virginia's Appalachian String Band Festival three times (and also placed in the top 3 numerous times). In the words of music promoter Fred Boyce: "With a repertoire as broad as that of the mandolin itself...the Mando Mafia stand poised to entertain, delight and instruct. They can be uproariously happy and bright at one moment, and then turn right around and deliver a somber rendering of something that sounds as though it just got off the boat from the Old Country. The Mando Mafia is definitely one group of 'dons' you should seek out at every opportunity."